Smitha Rajan has been giving stage performances since the age of 5. Each program has been a learning experience and has had its share of memories. Here are some of those that are special and cherished for Smitha. Being blessed by Mother Teresa at Calcutta in 1992. My grandfather had a very powerful stage presence and outshone any other person who happened to accompany him. So it was an entirely new experience for me to be able to perform alongside with him. I felt deeply privileged. I also felt very blessed. This was at Shri Poornathrayeesha Temple Festival in 1988. It is a program that will be etched in my heart forever. My grandmother used to give several lecture-demonstrations on Mohiniyattam. When she became too old to actually take up the demonstrations, I had the honor of doing that. This gave me an opportunity to be an instructor for other famous dancers and teachers - some of whom are Kalamandalam Smt. Saraswathi, Smt. 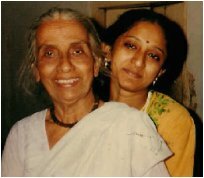 Shyamala Surendran and Smt Mandakini Trivedi.